Anglers experienced another difficult week on the Moy with angling improving over the weekend. Only a few fish were reported during the early part of the week but following a rise in water level on Friday night conditions improved considerably on Sunday resulting in a number of nice fish being caught. On Armstrong's, Tom Lawler, Athlone, had a fine 12 lbs. 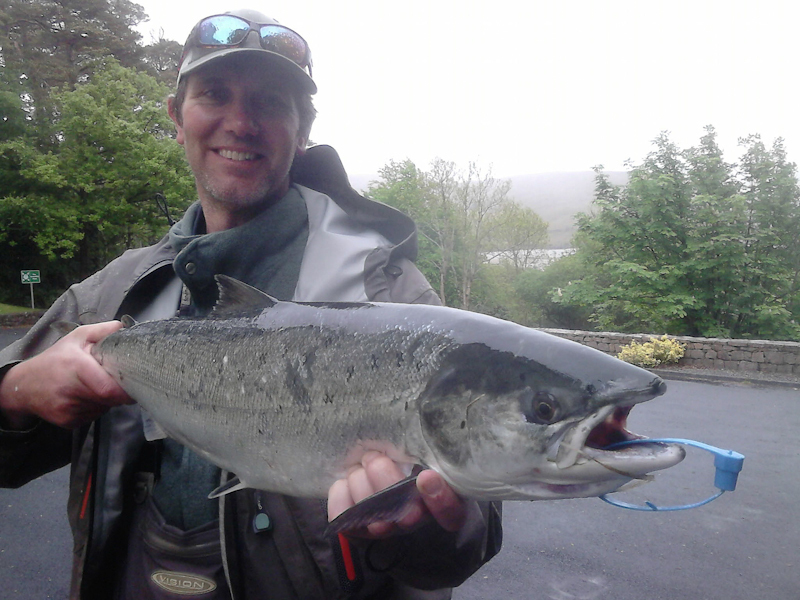 salmon on worm, while Australian visitor, Colm Trusker, was successful on Cloongee landing a nine pounder also on worm. Also on Cloongee, Clément Polard, France, enjoyed a very good week's fishing with a total of 7 salmon (3 released) between 7 lbs. and 11 lbs. all on bubble & fly. Reg Bishop, UK, Patrice Lacombe, France, and Kevin Agnew, Northern Ireland, were amongst the successful anglers on the East Mayo water. They all had fish between 7 lbs. and 10 lbs. on worm. Clément Polard with one of his 7 Cloongee fish. Despite difficult conditions throughout the week, Judd Ruane reported some good results for his clients fishing for sea trout in the Moy Estuary. Adrian Logue from Northern Ireland, did particularly well boating a number of nice sea trout including a fine fish over 40cm. A happy Adrian Logue with two fine Moy Estuary sea trout. To book a day's sea trout fishing visit www.fishingireland.ie or contact Judd on +353 (0)87 6736969. Luke O'Connell from Ballisodare Angling Club reported that it was a slow week from May 16th until May 22nd on the river. Anglers hadn't caught any salmon up until Saturday due to very low water levels after a dry spell. Heavy rain fell all day Friday leaving the river in lovely condition for the weekend, resulting in some decent fishing with prospects looking good for the coming week. On Saturday, visiting anglers Markus and Francis from Austria and Switzerland had a fish each at the falls weighing 8 lbs. and 5 lbs. both on the worm. Michael Mullaney and Vincent Henry both released 6 lbs. fish on the fly. Sean Gallagher had a 7 lbs. salmon at the Falls on Sunday; Heather Chambers took a fine eight pounder up river on the worm. Bernie Marshall released a fish of 5 lbs. on the prawn at the Falls, while Bernard Harte and Michael Mullaney both released 5 lbs. fish on the fly. Anglers on Lough Arrow reported excellent fishing over the past week. Dry flies and the dap worked best and many good sized brown trout were caught. Ricky Fabozzi & Jim Henry, Sligo had 30 trout over 4 days fishing averaging 1.25 lbs., best at 2.5 lbs. Golden Olive Bumble and Sooty Dabblers worked best for Jim and Ricky who released most of their fish. Elsewhere, local angler, Yvonne Frazer caught a lovely 2.8 lbs. Lough Arrow beauty on the dap. Yvonne Frazer with a fine Lough Arrow Trout. On Sunday, Lough Arrow Fish Preservation Association & District Angling Club held its annual Mayfly Competition. Twenty-five anglers made it to the weigh-in and a total of 61 trout were recorded. The competition was fished on the basis of the heaviest fish over 13". Lough Arrow Fish Preservation Association & District Angling Club would like to thank the McDonagh Family (Bow & Arrow Bar & Lounge) for hosting the weigh-in, various sponsors including Terry Mann Fishing Tackle, Southside Angling, Lough Key Forrest Park Experience (Floriane Frazer), Simon Steel, Ronnie Chisim, Karl Murrin, Brian Farrell for taking photographs and all competitors. 2nd Ken Murray 3.440 lbs. 3rd Peter Roche 2.666 lbs. 4th J.J. McDermottroe 2.594 lbs. 5th Finian Dodd 2.582 lbs. The juvenile section was won by Alex Smith (8 years) with a fish weighing 1.102 lbs. and in a close second was Oliver Wall (10years) with a fish weighing 0.924 lbs. 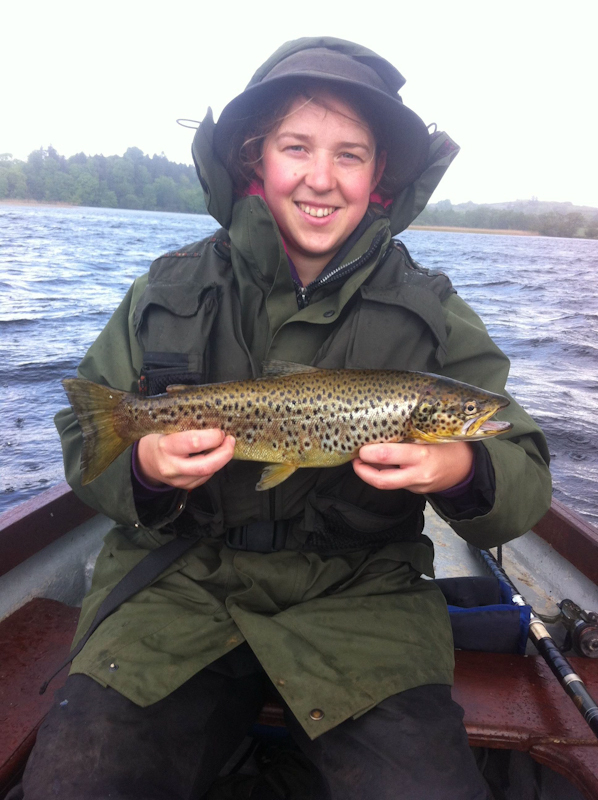 For both young anglers it was their first ever trout on Lough Arrow! Well done lads! The club's next competition will be held on Sunday 21st August. 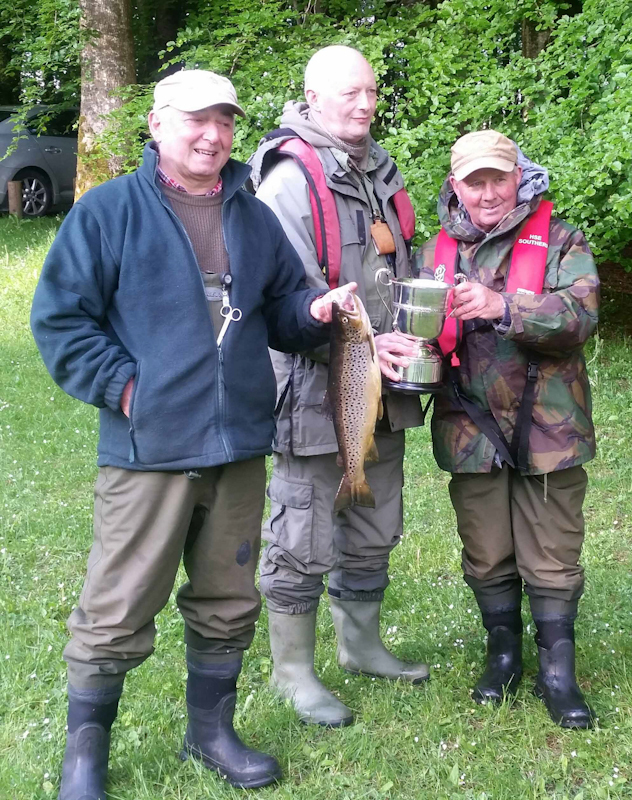 Sligo Anglers Association fished the Lough Gill Festival Cup Trout Competition over the weekend. A total of 23 anglers took part in the event recording 13 trout for weigh-in. The competition was won by Ricky Fabozzi and Jim Henry, Sligo with a cracking 4 lbs. trout caught by Ricky on a dry Yellow-Black Wulff. Ricky Fabozzi & Jim Henry receiving the Lough Gill Festival trophy. On Sunday 22nd May a party of anglers left Killala Harbour at 9.00am and headed out into Killala Bay. The weather was fine with a light south westerly breeze. Light showers were expected so the skipper, Donal Kennedy, headed out to one of his favourite spots to try and catch some flat fish. Donal came well prepared with plenty of fresh frozen mackerel to use as bait. The reason the skipper decided to try for flats was because the weather was to change later in the day with the wind picking up and changing direction which would have made it very difficult to fish that area. The anglers were not disappointed over Donal's decision catching dab, plaice and some nice turbot. Even Donal himself scored on the day catching a fine turbot. As the wind changed so did the tactics. Donal found more sheltered waters on the west side of the bay resulting in a couple of cod along with pollack, best up to 6 lbs. Pouting, coalfish and gurnard were also landed and rounded off a very enjoyable day for everyone! 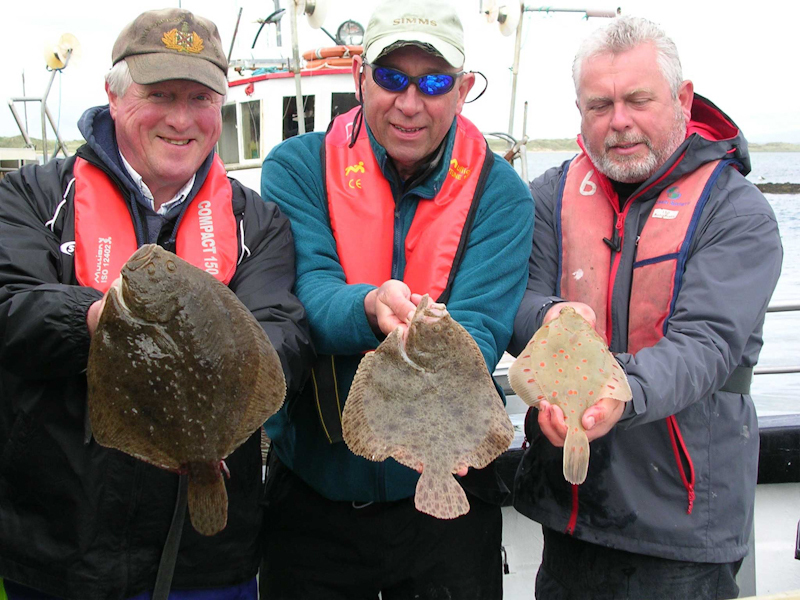 Turbot and plaice were amongst the catch on Killala Bay. It's been a strange season this year, with growth of many species several weeks behind, and the sparser than usual mayfly hatches have been frustrating anglers no end. Weather conditions haven't helped, with northerly and easterly winds (or no wind at all!) and bright sunshine hampering traditional mayfly fishing. Buzzer fishing is producing the odd good fish at the moment, but overall the mayfly fishing is poor. Lough Corrib on Monday 23 May. Not ideal mayfly fishing conditions! Declan Gibbons reports that in the Cornamona area fishing has been poor overall during the past week, with no significant hatches of mayfly. Many anglers were left frustrated having spent many hours fishing without even seeing any fish. Patrick Brown, Cornamona had 3 trout , best was just over 3lbs on Saturday. Sean and Cillian Breathnach along with their father Paraic, from Cornamona fished for a few hours on Sunday and landed 5 fish, with 4 released. Padraic O' Malley and two friends from Maam had great action on one evening during the week, boating 5 fish in the space of half an hour at Corrnamona Bay. Of the three, Peter Robinson came out best with a fine fish of just over 5lbs. Richard Molloy of Ballard Shore Boat Hire and Self catering (087-2879339) reports on some visitors having mixed fortunes on the lake. Those who had fish included father and son duo Matt and Paul Geraghty from Ashbourne Co.,Meath who had 16 trout on the dap for their visit, with 12 of them sportingly released and 6 of them around the 2.5lbs mark. Paul also had a cracking trout of 13Lbs trolling which he sportingly released. Local man Patsy Coyne, Cornamona had a fine fish on the dap of over 6lbs. Cork angler Cal Healy had some mixed fishing when hatches were moderate to good - the fishing matched the hatch. 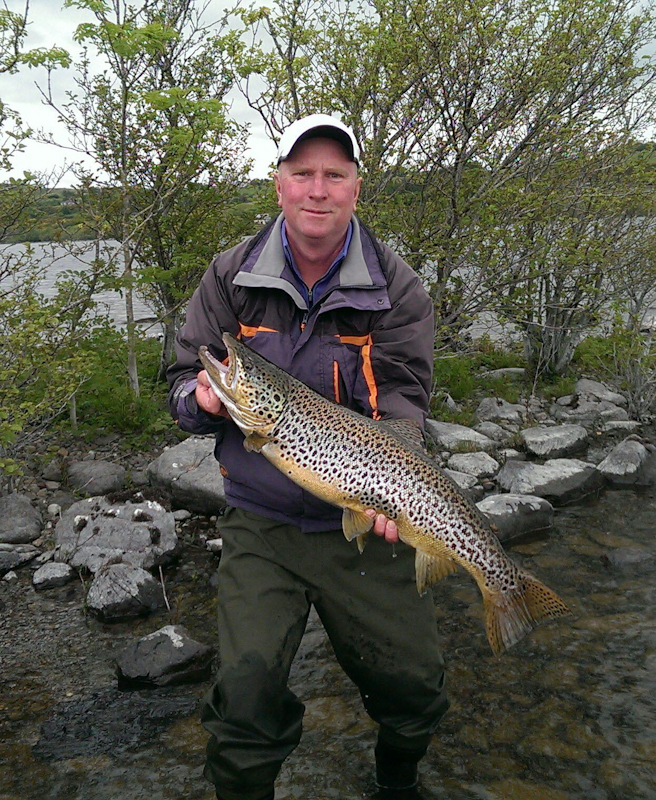 Paul Geraghty from Asbourne, Co. Meath with a beautiful 13lbs Corrib trout he caught recently. The fish was released after a quick photo. Stephen Lydon of Lydons Lodge Cong (lydonslodge@gmail.com; 094-9546053) says some of their visitors enjoyed some sport for their efforts. Cavan men Cian Murtagh and Vincent Kelly had 13 trout for two days last week with the best fish being 2.5lbs on wet mayfly patterns, and many more undersize fish. Also staying at Lydons for fishing were Tim O'Donnell and David Plumpton, who had 6 trout from 1-2.5lbs in the Dooras area. Steve Palmer had 6 fish from 1.5-3lbs, returning three, all on the dap. 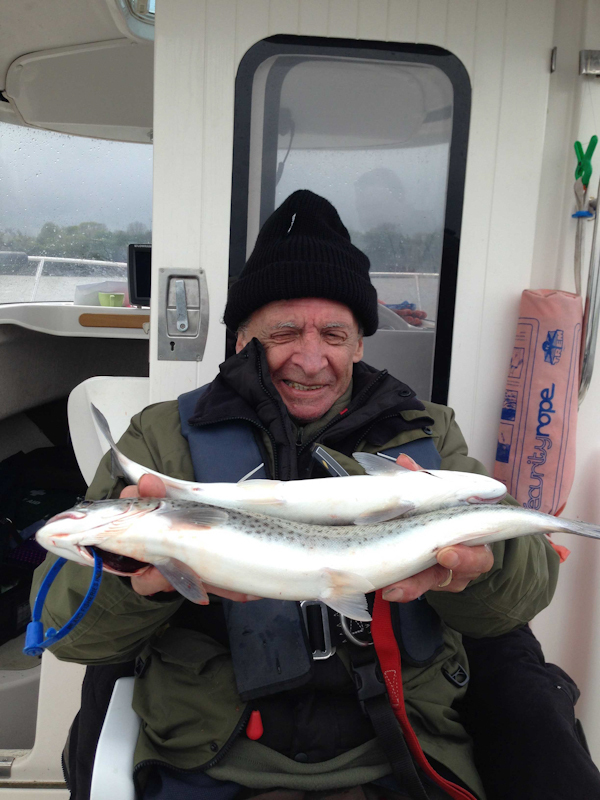 John Lydon also boated guests in the Castletown area on Saturday last with several fish caught fish ranging in size from 1.25-2.5lbs. Mike Holian from Bayview Lodge, near Cong (www.bayviewangling.com, tel. 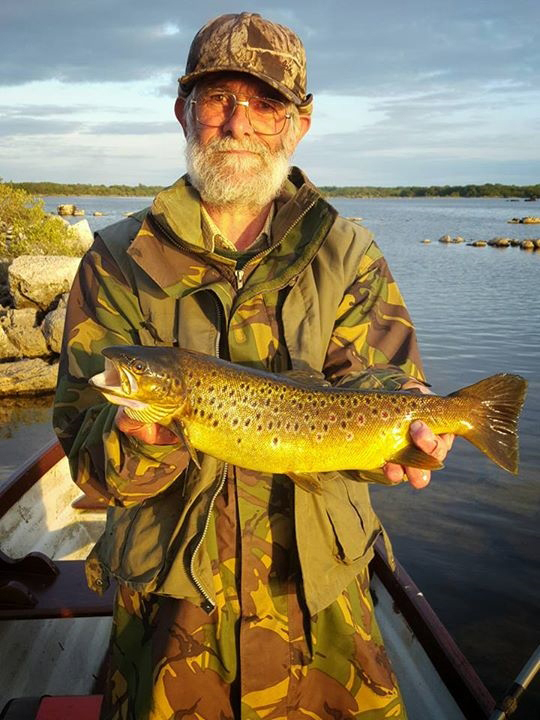 +353 (0)94 95 46385) was in touch to report on mayfly fishing for guests staying at the lodge, and fishing with guide Robert Holian, over the last few weeks. Mayfly fishing was late starting in the Salthouse Bay area. Dietmar Tiefenhaler, Austria and three friends had 27 trout for one week trolling on Corrib & Mask, keeping 3 for the table for 8.5lbs. Rolf and Walter Bucher from Switzerland spent 18 days trolling on Corrib and Mask, landing 46 trout, releasing all but 5, best 7.5 lbs, two of 5.5 lbs and two of 4lbs each. Paul Ramsey, Cross, had one trout of 4 lbs on dry fly. Robert Holian and David Ryan, Cong, had 6 trout on wet fly. Sean Keenan, Dublin, landed 6 trout over 2 days on wetfly. Simon Williams, Dublin, had 6 trout over 3 days on mayfly. Rory and Cormac Nicholson, Galway, had 5 trout over the weekend on mayflies, including one for Rory of 3.5lbs. Aiden Glynn, Galway, landed 2 trout on wetfly. Mark Husson's party from England, guided by Robert Holian and Pat Egan, had a total of 70 trout over 4 days dapping mayfly, with most of the fish released. Philip Bowman and friend from Belfast landed 5 trout over 2 days, best 2lbs, all released. Cian Murtagh, Cavan staying at Lydons Lodge in Cong, pictured with an Inchagoill trout caught during the mayfly season, 2016. Ronan Cusack says there are mixed reports from Mask this week, as our mayfly season should be in full swing. Sparse hatches of fly, coupled with bright sunshine and a constant change in wind direction, has made traditional mayfly fishing very difficult. Conditions for the latter half of last week suited wets and dries; unfortunately an easterly wind took hold over the weekend and made angling a bit more challenging. Local anglers Kevin Egan and Michael Vahey had 5 for an afternoon on Friday last on a combination of wets and dries (best fish 1.75lbs, all returned). Ballinrobe anglers Philip McGoldrick and Kieran Biggins fished wet flies for a day over the weekend and they finished with 7 (best fish 2lbs, all returned). Conor Ledwith and fishing partner Kevin Crowley (not your correspondent!) from Headford fished dries for a few hours on Monday evening in Caher Bay and Kevin landed a lovely 3.5lbs trout on a Klinkhamer. John Young, UK with a fine 5.5lbs Mask trout, May 2016. Kevin Crowley with a fine 3.5lbs trout from Lough Mask, May 2016. Ken McCarthy from Dublin had 3 on wets on Monday last (best fish 1.5lbs, all returned). 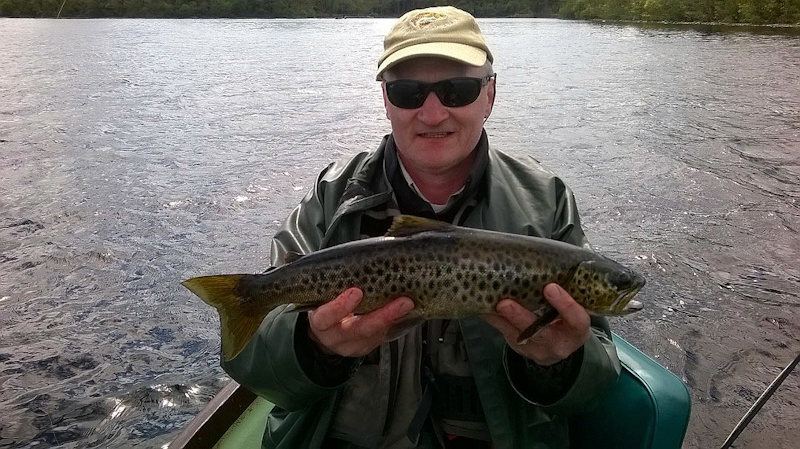 Danny Joyce from Ballinrobe also had 3 on Sunday on wet flies (best fish 1.5lbs, all returned). 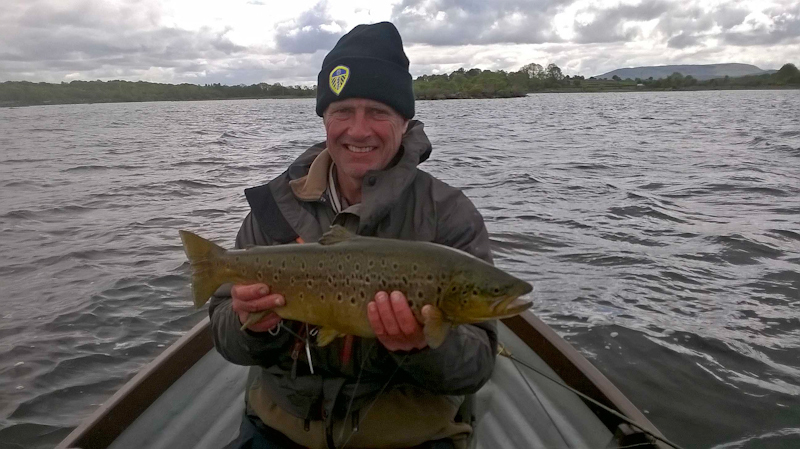 UK angler and regular visitor to Lough Mask, John Young fished with Ronan Cusack on Sunday last and they had 9 trout on a combination of wets and buzzer (best fish 5.5lbs, all returned). The wind is to shift back to a northerly direction towards the end of the week which is good news for Mask anglers. Water levels finally dropped to one gate this week on thw weir in Galway, with much better conditions for fly fishers and grilse appearing in better numbers in the river. There were 15 fish landed for the week, with anglers enjoying further sport with other fish but unfortunately parting company before meeting on the bank. The 17th was a good day with 4 fish, including a fish of 4.5lbs for French visitor Jean Le Moal on a spinner. UK visitor Alyn Lynton landed two grilse of 4lbs and 6lbs on fly, while Tuam man Louis Brennan had a 6lbs fish shrimp. Alan Lynton had another fish on the 18th, a fine fish of 10lbs on fly. The following day Ber Gilsenan from Multyfarnham landed a 9.5lbs salmon while spinning, John Anderson had a 5lbs fish on fly, while Jean le Moal scored again with a 4lbs fish on spinner. Over the rest of the week Jim Kane landed a 5lbs grilse on fly, as did John Ryan from Tipperary, while Navan man Paul O Malley was rewarded with a 10lbs springer taken on the fly. Lady angler Leen Verhoeven from Belgium caught her first salmon on the fly - a nice grilse of 4.5lbs. Dublin angler Brendan O'Connor, caught a 5lbs grilse on fly, and Ashley Mathews from Clifden took a 6lbs fish, also on fly. Water conditions and weather are excellent now, and with the grilse run starting, angling prospects for the coming weeks are very good. Fishery manager Osgur Grieve reports that last week was tough going with water levels dropping to 0.6m at one point. Anglers fished hard in these conditions and finally Stephen Sayer from the UK caught a nice fresh fish weighing 7lbs on Tuesday 17th, which was caught on a Cascade. Leigh Hookes, also from UK, fished on the morning of the 19th and caught a fresh salmon weighing 11.6lbs on a Black Frances. For fishing please call bookings on (095) 42208 as we have beats available. 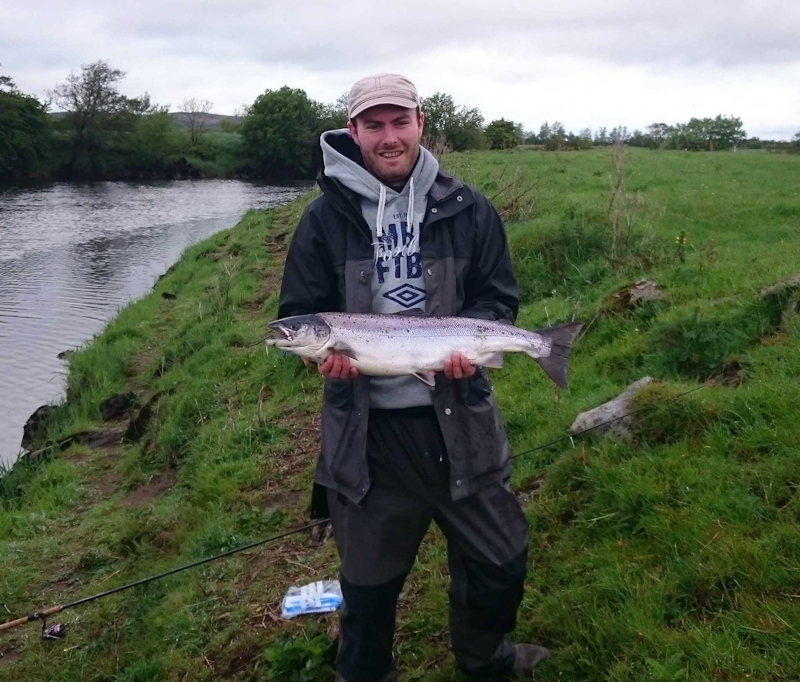 Leigh Hookes with his 11.6lbs salmon from the Erriff Fishery.